Whether you are an endurance athlete, a runner, cyclist, cross fitter, orange theory enthusiast, an avid walker or hiker you will inevitably be hit with pain at some stage. The good news is that most lower extremity issues once properly diagnosed, are very manageable with corrective exercises and manual therapy. The body is a system of moveable and stable parts, and if any of the chain is broken you will get pain. Your feet provide a stable platform for your body, but they need to move in the right places and be strong. You ankle needs to be mobile! You knees on the other hand are stable and count on the ankles to be mobile and the hips to be mobile and strong! 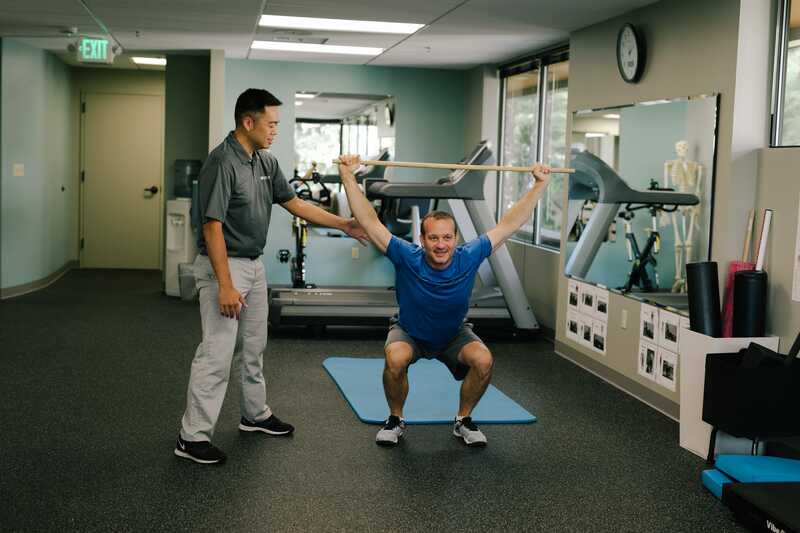 Our skilled Clinicians know the body is a sum of moving parts all reliant on each other. We will take you through orthopedic evaluation to make sure nothing is broken or torn, and then a systematic and through functional evaluation to correctly diagnose and treat your injury. The most common type of knee pain falls into this category. If you have experienced sharp pain under your knee cap which gets worse when you kneel on it, or when you try to squat, do step ups or lunges, you most likely have a patella femoral problem. 80% of the time this type of knee issue comes from muscles that are too tight and scarred down, fascial restrictions, patella tracking issues due to muscular imbalance and weakness, weak hips, mobility issues in your hips, ankles or feet, incorrect footwear, poor movement patterns or arthritis. Skilled manual therapy combined with biomechanical corrections and strengthening are curative in most cases. Your next move probably doesn't need to be knee replacements, cortisone injections and specialized orthotics. Instead, we want you to come in and let our expert team assess your situation. Imagine all that force pulling on a single tendon, which then attaches to your knee cap and then to your shin bone. If you are experiencing pain or swelling around your knee cap, point tenderness over your patella tendon or just generalized knee discomfort with running, jumping or cutting then this might be your issue. Most knee tendon and capsule issues can be quickly managed with deep soft tissue therapy to reduce the scar tissue in your quads and take the pressure off your tendons. One of the most common types of knee pain in runners and cyclist, this condition is often mismanaged, or ignored leaving the athlete with chronic knee pain. The iliotibial band (ITB) is a fibrous structure that crosses over both the hip and the knee joint. It inserts at the lateral (outside) of the knee, and this where the pain is usually felt. Treating ITB issues requires correct manual therapy techniques to address hip and thigh musculature and corrective exercises. Gait mechanics and foot wear must also be analyzed and assessed. If you are having lateral knee pain, don’t wait until you are disabled. Come and get the right treatment for your knee. Maybe your ankle has started developing a tight burning pain when you exercise. It feels better when you rest it but as soon as you get active it comes back with a vengeance. Your ankle looks puffy and hurts when you wear shoes that dig into the back of your ankle. Your achilles tendon is the biggest tendon in your body and becomes inflamed fairly easily. The tendon attaches to your heel bone or calcaneous. The calf muscles which are often too tight, put tremendous force on your achilles tendon, causing it to become injured. Even though you tell yourself, 'No pain, no gain', when you try to push through you just can’t. The tendon will become inflamed and it can easily take 6 mo to recover. Our Sports Clinicians know that to fix an achilles problem you have to release the deep muscle of the calf, correct hip and foot mechanics and train you functionally. Don’t let your achilles sideline your health, come in and let us manage it for you. Ankle sprains are common and usually cause ligament laxity, bruising, swelling and pain. Occasionally a bad sprain many cause a ligament tear or bone fracture. Full recovery from an ankle injury requires that the soft tissues of the ankle heal completely and without excessive scar tissue, ankle mobility be maintained, and ankle stability and balance be addressed. Our clincians know how to rehab you from your ankle sprain and get you back to running, cutting and jumping without pain. Runners frequently suffer from “shin splints”. They begin to feel a burning or aching feeling along their shin bone. This can be on the inside or out side of their shin. If left without treatment, shin splints can lead to stress fractures. Our Clincians know how to rehab you from anterior or posterior shin splints and get you back to running, cutting and jumping without pain. You're out walking with your spouse when the bottom of your foot starts burning in pain. You try to move your foot differently as you walk, but it doesn't help. You shorten up your stride and limp painfully home. Ice helps, thank goodness you think, it was just a bit too much activity. The next morning you get out of bed and the moment you load your foot the pain is crippling. You hobble downstairs for an icepack and ibuprofen, taking the steps one at a time. Plantar fasciitis occurs when the fascia overloads and becomes inflamed. The pain can be intense and stop you from many activities. Treatments include manual therapy to the foot, ankle, calves and sometimes hips to correct the problem. Footwear, gait mechanics and rehabilitation are essential to get rid of this problem. Understanding what's wrong is critical...If you're hurting, schedule an assessment get help figuring it out.